On Monday, the 20th of May, 2013 following nine years of negotiations between the Royal Cornwall Museum in Truro, and members of Kehillat Kernow and the greater Jewish community, the Museum returned a 250 year old Torah Scroll used in the Falmouth Synagogue in the 18th and 19th centuries to Kehillat Kernow, the present Jewish Community of Cornwall. This unprecedented, historic event cannot be under-estimated in terms of its incalculable value to the spiritual life of this community. Celebrations will start at 10.45 am on 28 May 2014 at a formal giving of the scroll at the Museum and a procession to the Municipal Building, Boscawen Street where there will be a special religious service in the Town Hall followed by speeches and a buffet lunch in the Council Chambers with all those from the Museum and the greater Jewish community involved invited to attend. Why is the scroll important to us? A Sefer Torah (Torah Scroll), is one of the holiest objects in the Jewish religion. It forms the central, most serious aspect of every Shabbat and almost all festival services. It is integral in rites of passage (Bar and Bat Mitzvahs, baby blessings…), ceremonies and is essential for educational purposes. It is considered so precious that the parchment, upon which all the letters are hand-written, cannot be touched. Indeed a “yad,” a pointer, is used for reading to ensure this and the Torah itself is covered and wrapped in its mantle or prayer shawl when not unrolled to be read. It is meant to be stored in an Ark (a specially built container), under dry climatic conditions when not in use. Because it is so preciously cared for, it is not uncommon for synagogues to be using Torah Scrolls which are hundreds of years old. Routine examination of the parchment and each individual letter is de rigeur. In case of damage to either the parchment, Etz Hayim (wooden spindles upon which the Torah Scroll is rolled), or letters and acertified sofer (Torah scribe), would examine all aspects and make necessary repairs. 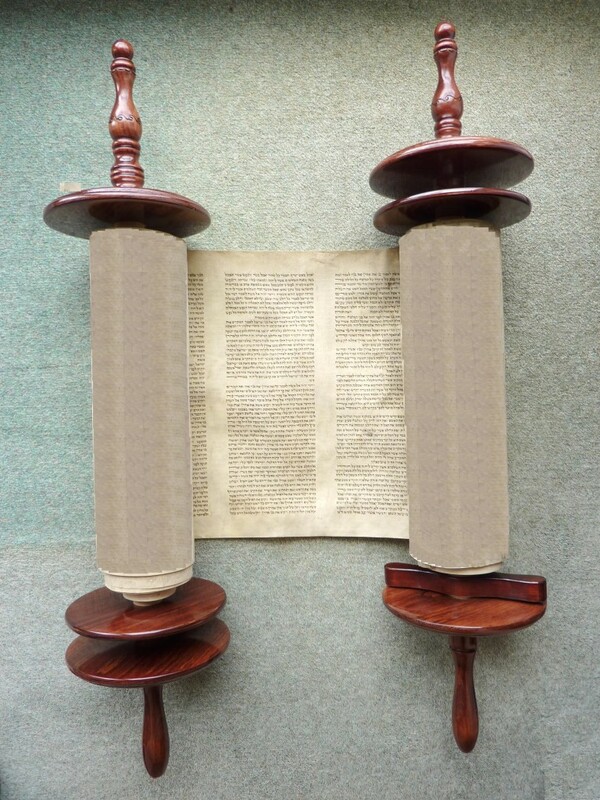 The Scroll is of particular importance not only in terms of continuity as it was used in the Falmouth Synagogue, but is of immense historical communal relevance and is of incalculable religious significance for us as a recognised religious community. A Torah Scroll is meant to be used; if a scroll can no longer be used, according to Jewish tradition, it must either be buried in a Jewish cemetery or held for safe keeping in a recognised institution such as the Royal Cornwall Museum. It may not be destroyed. In the case of this Torah Scroll, the Scroll has been be restored, repaired, and will be used. From an ethical, religious, communal, and historical standpoint, this Scroll clearly deserved to be restored and used by an accredited Jewish community who would safeguard and treasure it. The Sefer Torah is Ashkenazi – medium clear writing on mashuach (pasted) parchment. It is light in weight having a parchment size is 33 cm with 53 Lines. This Sefer Torah is more than 250 years old and comes from the German Bohemian areas, based on the type of writing. As it was in the Falmouth community for many years and being small, it has certainly had good use. The Sefer Torah’s letters were in bad condition in every column throughout due to its age and use. 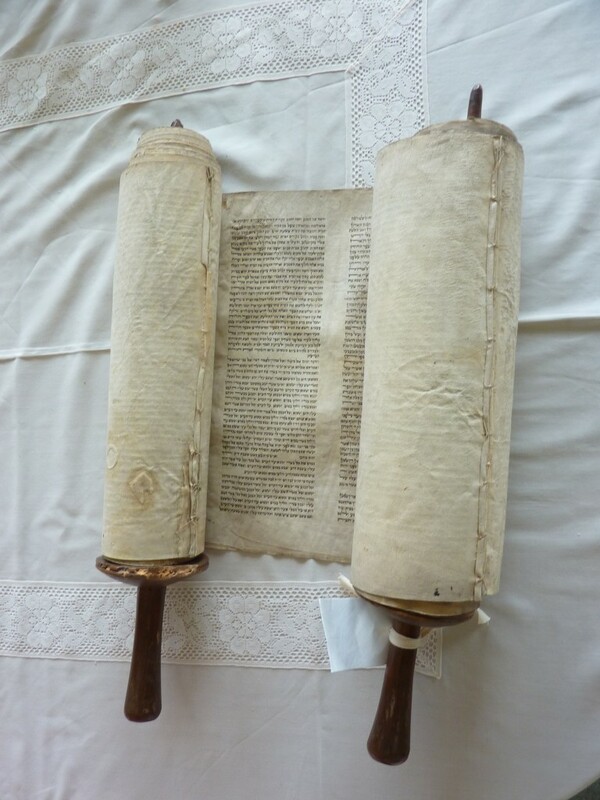 The Sefer Torah had potential, subject to the provision that all the letters needed attention as well as the holes in the parchment needed careful repair. 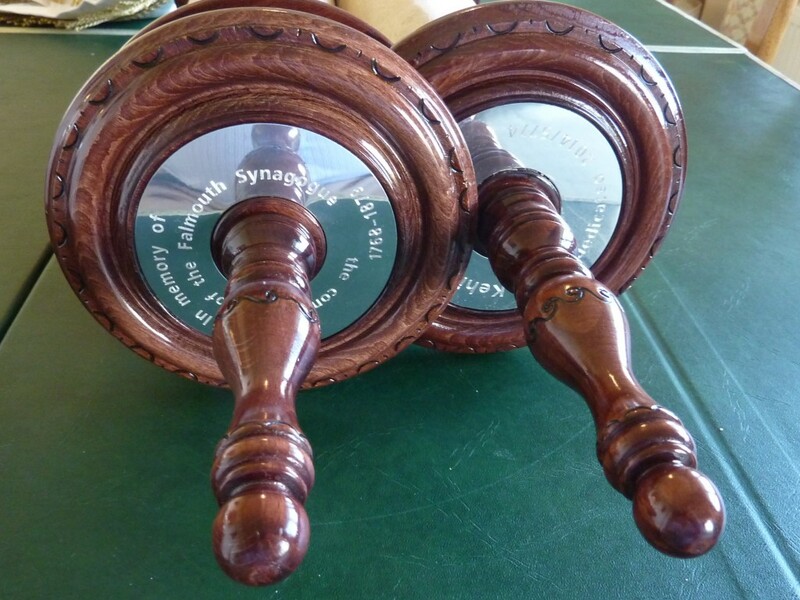 Bernard Benarroch, a Certified Torah Scribe asked by Kehillat Kernow to advise them, when he first saw the scroll, stated that in normal circumstances, he would not attempt to repair or restore this type of Sefer Torah, due to the many hours required to touch up every single letter. However he said “it would be an honour to restore this Sefer as I know that it is an intrinsically important to the Cornwall community.” The Scroll has taken six months to repair. In September 2004, Chairman Harvey Kurzfield wrote to the Museum requesting that the community be allowed to make use of one of its Torah Scrolls. Harvey was allowed to take a scroll to London to see if repairs were possible. No decision was taken by the Trustees of the Museum. In January 2010, Leslie Lipert noticing that the Museum was selling some of its paintings, contacted Hilary Bracegirdle the Museum’s Director to ask if Kehillat Kernow could buy one of its four Sefer Torah Scrolls. She informed him that the Museum would not sell them but would consider giving one if Kehillat Kernow could put a reasoned argument why it should have a scroll. In April 2010, Elkan Levy, then Director of Small Communities (US), and Leslie Lipert of Kehillat Kernow, examined three of the scrolls at the museum, after which Elkan wrote a report on the historical significance and repair possibilities of the Sifrot Torah held by the Museum and conferred with Mr Bernard Benarroch, certified sofer, to indicate if repairs were possible. In February 2011, Bernard Benarroch, after examining all four scrolls, wrote a report and appraisal to the Truro Museum. He agreed to restore one of the Sefer Torahs (the smallest of the four and best suited in his opinion for the KK community), for the Cornwall Jewish community. In May 2011, Harvey Kurzfield and Leslie Lipert wrote with the help of Pat Lipert, Elkan Levy, Keith Pearce, and David Jacobs Director, of Synagogue Partnership (MRJ) an extended letter with detailed appendices to the Royal Cornwall Museum requesting the scroll and giving rationale for such an action. As a result, the Museum Trustees asked The Museums’ Association for written advice. In December 2011, after studying The Museums Association previous cases further additional relevant information was supplied to them. In March 2012, The Museums’ Association advocated that the scroll be returned to Kehillat Kernow subject to conditions. In May 2012, Elkan Levy and Leslie Lipert met with the Chairman of the Board of Trustees of the Museum, Mr. Peter Strethridge, who agreed to put the request to return the scroll to KK to the Museum’s committee. A sub-committee was subsequently formed to study the matter. In October 2012, a letter advocating the scroll be returned to the Kehillat Kernow Community by the Chief Rabbi Jonathan Sacks, was sent to the Museum trustees (something which the trustees requested). In February 2013, Elkan Levy, Harvey Kurzfield and Leslie Lipert met with the some members of the sub-committee’s of the Museum who proposed the Scroll be given to KK subject to certain conditions that were acceptable. They agreed to put it to the whole sub committee for approval. The main committee on 15 March 2013, approved the return of the Scroll to the Jewish Community of Cornwall. 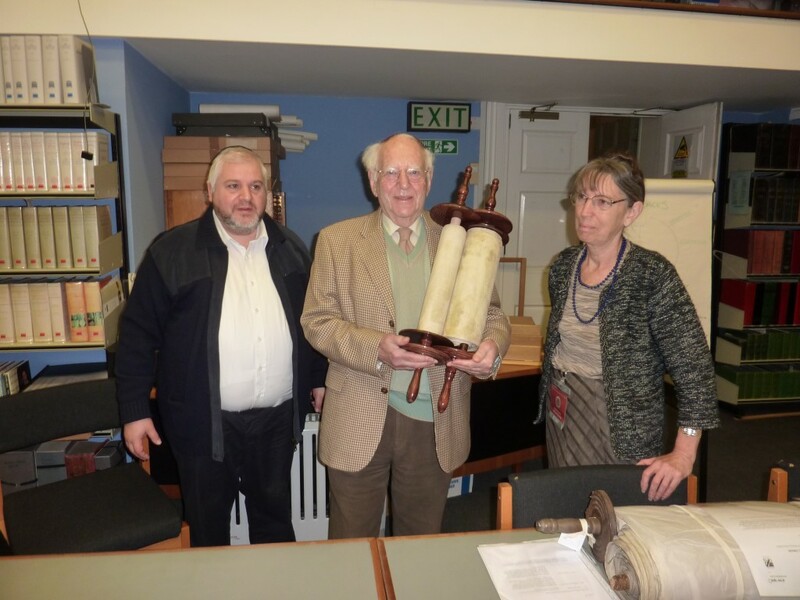 In May 2013, Harvey Kurzfield and Leslie Lipert met with the Hilary Bracegirdle the Museum’s Director, whose help in the negotiations had been invaluable, to collect the Scroll ready to be transferred to London for repair by B. Benarroch to make the Sefer Torah fit for use in synagogue services. In December 2013, B. Benarroch met Leslie Lipert and handed over the repaired scroll at the Museum. 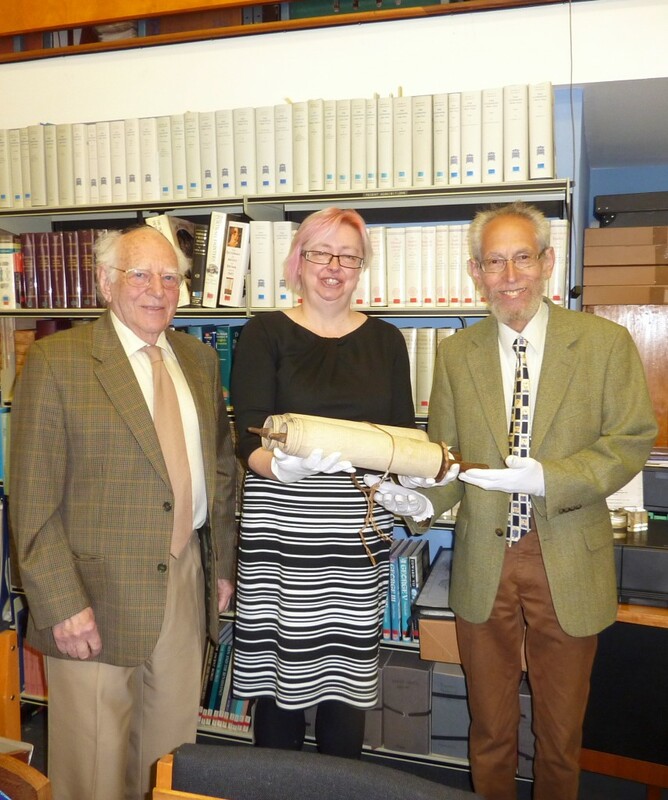 Then they met with the Angela Broome, Librarian Archivist at the Museum, and delivered the report of the full details of the refurbishment of the scroll, a condition of the gift from the Museum. With this as my inspiration I wrote to the Director of The Royal Institute of Cornwall, Caroline Dudley to ask if we, as a community would be able to make use of the Torah Scroll housed in the Museum. Ms Dudley phoned me some time later to say that my request would be put to a meeting of the council for the Museum, which would take place in October. In the meantime I arranged with the librarian at the museum to view the Torah Scroll. It was quite something to see the Scroll, which, though in a somewhat dilapidated condition was still clearly readable. There is, however, considerable damage to both scroll supports – some has been completely eaten away by woodworm. The librarian assured me that this had now been treated and would not deteriorate any further. She also advised me that a Mr Jacobs had given the scroll, together with four or five other smaller scrolls to the museum in about 1898. There was no documentation available to suggest that a) he had the authority to hand over scrolls which presumably belonged to the then Jewish community or b) whether he intended the scrolls to be stored in the museum until such time as the Jewish community in Cornwall was reformed. The librarian also informed me that the scrolls had been kept in the appropriate storage for such artifacts thus enabling their survival into the 21st century. She is certainly very protective of the scrolls and feels that while they are in the museum they are in safe hands. She also allowed me to take some photographs of the larger scroll which I have place here for viewing. Following the council meeting I telephoned Ms Dudley to ask about the decision concerning the scroll. Although I have not yet had anything in writing the position, as I understand it is that we, as a community, may use the scroll for special occasions and services, but due to the present condition of the scroll it would still have to be kept in the museum. The museum officers are also willing for me to take the scroll to London to see if it can be repaired in some way – without impairing its “historicity”. This is what I intend to do at some point in the future. Keep your eyes on the website to see how this situation develops. Over the last few months we have been blessed with some memorable moments. As most of you know by now a party of Kehillat Kernow members drove to Exeter for the Erev Shavuot service at Exeter Synagogue. During the wonderful service the generous Hebrew congregation of Exeter presented us with a Torah Scroll. When I went up to receive the scroll I felt a huge surge of emotion, which I hope was shared amongst those of you who were there in the synagogue. Each time we use the scroll now there seems to be an extra dimension to our own services. I have written officially to Frank Gent and Tony Reese, but would like to express, once again, our sincere gratitude and thanks to the Exeter Hebrew congregation.